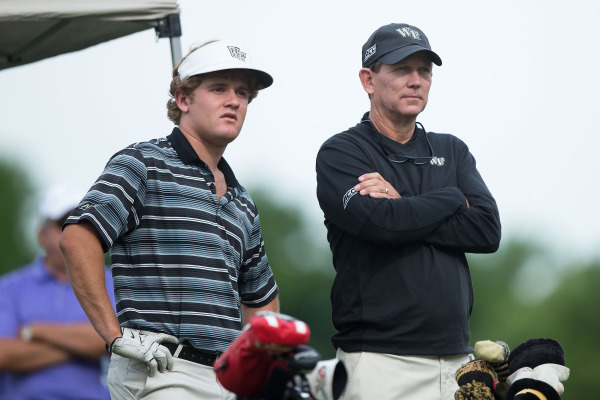 Head Coach Jerry Haas has the Wake Forest men’s golf team playing its best golf at the best time of the year. With the end of the regular season near and ACC Championship play approaching, the No. 8 ranked Demon Deacons look poised for a deep postseason run led by the great leadership of Coach Haas. Is there a difference in preparing for ACC play versus regular season play? No, not really. This year is a different year in the fact that we’re going to a completely different course. We’ve gone to Old North State for 18 of the 19 years that it’s been played, and we went to Disney World one year in 1997. Other than that, it’s been the same course. This course, Musgrove Mill in Clinton, South Carolina, is a completely different course. It’ll kind of be unfamiliar for any of us, and we talked about that at the start of the year. If you look at the events we played, we played a lot of new events this year, and that’s sometimes hard to do, because if you go to an event over and over you know where the pins will be and you know whatever, but we’ve done really well, and that goes to show that we have a good team and a veteran team, and a team that can hopefully adjust to the situation. We’ll just go in there and approach it like any other event, get one practice round just like everybody else, and just let her fly on Friday, Saturday and Sunday and see what happens. At Musgrove Mill, is there a particular strategy you plan on taking? You know, what I’ve heard is that you have to have a good second shot. I’ve heard the greens are pretty undulated, and they have bent grass, just like over here at Old Town Club, so that will be very familiar with our team. I think you have to have a game plan, from what I hear, and so there’s trouble out there, but if you stick to your game plan and put the ball in the right spot you’ll be successful. The practice round will be very important, and they know that. This year, they’re doing it different with everybody going off — there are 12 teams, so you’ll have six going off the front and six off the back, so basically everybody is playing at the same time weather-wise. That’s a good thing. Any players you’re looking at to shine at Musgrove Mill? The reason we’ve been good this year is because you never really know each and every day who’s going to have a good round. I don’t have it written down, but I’m pretty sure that every different guy has been the low-guy for us at one time or another. That being said, it is a team competition and we’re going to need all five guys. When we play our best, all five guys are around par and we end up throwing out a pretty low score. As a team, as far as comfort and everything, if you got all five guys playing well, then everybody’s relaxed. If you hear that one guy’s playing bad, then there’s a little more pressure. You know, we’re just trying to approach it like we’ve done all year. Obviously there’s more to it, but it’s still golf. It’s still 54 holes. What does it mean for the program for Will Zalatoris to be nominated for the Hogan award? He’s averaged 69.9 so far, and to be recognized as one of the top players in the country. As his coach, I’m not surprised, he won a couple times this summer. And he’s a really good player. Will got his third college win this year at the Dunes Club and conceivably could’ve won the next two and played very well. He’s really stepped up as a junior. He plays great in the Summer and plays great in school. Some play well in school but not in the summer, so I think he’s proven that 12 months out of the year, he can play anywhere and be successful. If you look at the golf stats and the Golf Week rankings he’s up there in the top five in both of them. That’s pretty evident of consistency, having good finishes and beating good players. The team has previously been really consistent, but after these last two runner-up finishes, is it difficult to maintain that same positive attitude? Since we shot 24 under at Augusta, we didn’t feel like we played great on the 36 hole day. We shot 14 under but felt like we made some mistakes and could haveve cleaned it up a little bit on the par fives. I said, “let’s just have a best last round,” and we did. Oakridge, Irish Creek — same thing. We didn’t play great on the 36 hole day, but we played nicely on the last day and gave ourselves a chance. We’re very capable of shooting good scores. On a whole, how have you remained consistent? We’re a team that’s very hungry for success, that pushes each other. Every different day, there’s a different guy that steps up, and we see improvement every month. In golf, unfortunately, unlike many sports, it takes a while for what you’re working on to sink in. It might be six months; it might be a year. Sometimes guys aren’t ready at first with their body or their mind to work it, but you can see each kid growing and becoming more successful. Ryan is a senior communications major and journalism and Latin American studies minor at Wake Forest. Ryan enjoys skiing, playing pickup basketball and reading aloud his favorite tweets to the staff of the Old Gold & Black on production nights, prompted or unprompted. Ryan is grateful to the Old Gold & Black for the journalistic and career opportunities that the newspaper has provided him throughout his time at Wake Forest.